There is a new kind of street food that has crept up on the streets of San Cristobal de las Casas in the last few weeks; Doriantojos. Take a bag of Doritos, cut it open from the side and fill it cafeteria style with different fillings and condiments and you have Doriantojos. They are served from a small stand on one of the walking streets north of Centro. Improvement on Doritos? Impossible, I thought but you never know if you don’t give it a try. It is possible to mix and match your choice of additives but being a traditionalist I chose the “El Nacho” Paquete. Jalapeños, Yellow (canned ballpark style) “Cheese”, cucumbers and a little salsa are thrown over traditional flavored Doritos and served with a plastic fork and napkin. Total cost about $1.16 US. Doritos are one of those things that have always fallen into the “guilty pleasure” category for me. They have tons of calories, tons of fat, preservatives, artificial dyes and little nutritional value. Doritos are contributors to the obesity epidemic, the bags are bad for the environment and, if you believe what you read on the Internet, Doritos can cause crazy dreams and delirium. Problem is that they taste so damn good. If I have one I can’t stop until I finish the bag. Having said that I don’t think I will be trying Doriantojos again. Doritos out of the bag are good enough / bad enough just the way they are. Adding more goop, calories, and textures to something that is already bad for me is totally unnecessary. Especially when there are so many other good alternatives nearby. Our local ice cream lady does the same thing and parks right in front of our house every day haha. 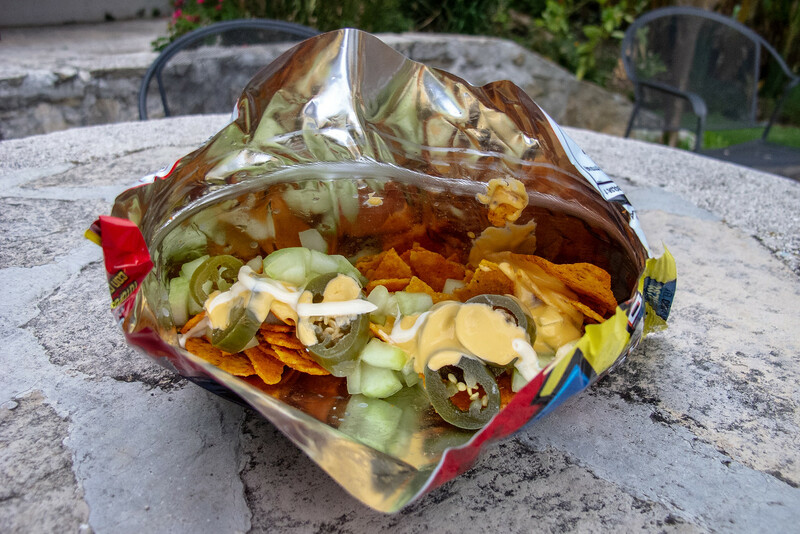 Take any bag of chips offered (Flamin Hot Cheetos, Lays, Taquis, Doritos, etc…) and you can add chili, nacho cheese, chamoy, lime, or jalapenos for around $2.00. Viva Long Beach. Come on! We have been doing this in Tejas since I was a wee one, Frito Pie!